(QCOSTARICA) Spends more and stays longer is profile of the typical European tourist, as the country sets out to conquer this market. According to data by the Instituto Costarricense de Turismo (ICT) – Costa Rica Tourism Board, European tourists stay an average of 17 nights, while the overall average is 13 and spends an average of US$1,660 as compared to the overall average of US$1,351. Increased promotion of the country to European tourists and the increase of direct flights between the Costa Rica and Europe has increased European tourism by 41.7%, according to data comparison between 1010 and 2015. Last year, at total of 393,115 European tourists arrived in Costa Rica, representing 14% of the 2.6 million arrivals in 2015. 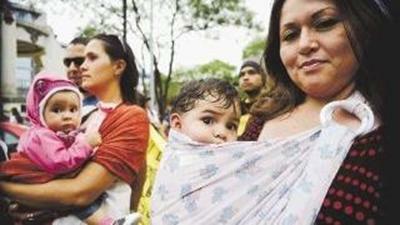 Tourism Minister, Mauricio Ventura, says there is room for much greater potential. Air France is the latest to join the list of European airlines with direct flights between Costa Rica and the “Old Continent” (Viejo Continente in Spanish) as many in Costa Rica refer to Europe as. The French carrier, with its maiden flight to Costa Rica touching down at 6:30pm today (Wednesday) brings the count to six European airlines (Air France, British Airways, Iberia, Edelweiss, Thomson and Condor) with direct flights between Costa Rica to six European cities: Frankfurt, Munich, London, Paris, Zurich and Madrid. 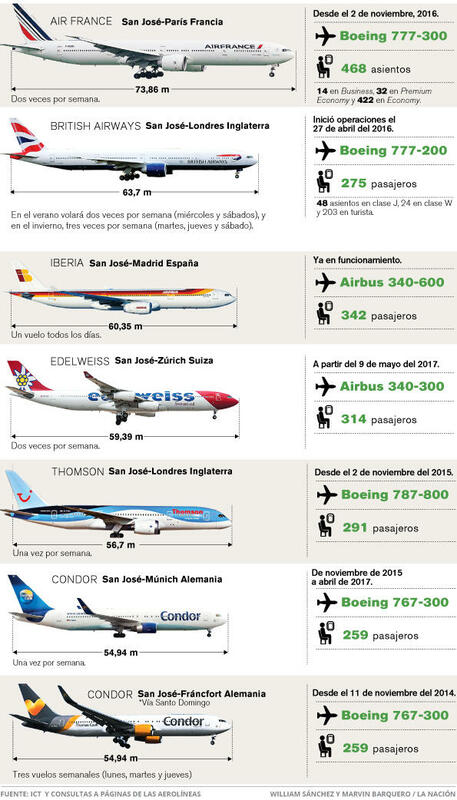 Graphic listing the European airlines by their passenger capacity by William Sanchez and Marvin Barquero for La Nacion compiled from data by the Tourism board. According to the president of Cámara Nacional de Turismo (Canatur) – National Chamber of Tourism, Pablo Abarca, it is important to note that the European tourist has a different “seasonality” than North Americans (the United States and Canada). That means the country will be receiving tourists during other times of the year, not just the big tourist rush of January, February and March. To meet the growing number of arrivals the Juan Santamaria international airport in San Jose is being expanded, more boarding gates and broader boarding bridges to handle wide-bodied aircraft like Air France’s Boeing 777-300 with a capacity of 396 people (more than 350 passengers), the highest capacity commercial flight to arrive in the country. The arrival of more European airlines has also brought down the typical cost of flying direct between Costa Rica and Europe, with economy class return flight going for as low as US$800.